Just bought my tickets to see O-Town perform at Durty Nellie’s on April 29 in Palatine, IL. I am so excited. I still need to buy VIP for the show so that I can meet Erik-Michael Estrada. I can’t wait to see him again. I’ll wear the Townie shirt that Cassie is making for us, my Townie & EManiac bracelets from Jessicca and my Townie friendship bracelet I made. Posted in Concert, O-Town | 1 comment. I won a free General Admission ticket for Saturday, November 12, 2016 for the Rewind Convention. I want to do the photo op for Erik-Michael Estrada but it is only on Sunday, November 13, 2016. I was able to switch my free GA Saturday ticket to GA ticket for Sunday. I’m so excited. Cast members of the TV show, Beverly Hills 90210 will be at the convention. I am a huge Beverly Hills 90210 fan so I am doing photo ops for Jennie Garth and a duo photo op for Luke Perry and Jason Priestley together. I will also be doing photo ops with Joey Fatone of *NSYNC, Drew Lachey and Jeff Timmons of 98 Degrees. I can’t wait. I’m hoping there will be tons of free celebrity booths so that I can meet other celebrities…get their autographs and take selfies with them. My mom is going with me. I’m so giddy and excited to be going. I can’t believe that in 27 days I will be meeting cast members of Beverly Hills 90210 and Joey Fatone. I’ve already met Drew Lachey and Jeff Timmons at the MY2K tour this past summer and I’ve met Erik-Michael Estrada three times already…at O-Town concerts in 2013 and 2016 and at the MY2K Tour this past summer. Posted in O-Town, 98 Degrees, Beverly Hills 90210, *NSYNC, Rewind Convention | Leave a comment? April 1, 2016 is the one year anniversary of the opening of Sonja-Leigh’s I Luv Erik-Michael fan page dedicated to Erik-Michael Estrada of O-Town. On that day she did three contests in honor of the one year anniversary. She did contests on Twitter, Facebook and Instagram. What you had to do to win a picture was to favorite and RT this post on Twitter. I did that and This morning I found out that I won. I can’t wait to see what picture I get. 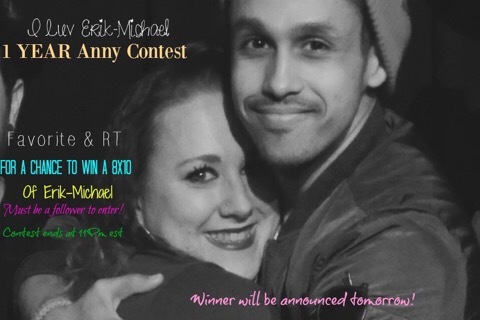 I’m so excited I won because I love Erik-Michael Estrada. Posted in O-Town | 1 comment.